Before we get to the season-to-date averages, here are the winners and losers from February 25th through March 3rd — based on the coveted 18-49 demographic, as measured against the last original episode. Week-to-Week Gains: Blue Bloods 1.7/6 (13.3%), Mike & Molly 3.4/9 (+6.2%), The Good Wife 2.2/6 (+10.0%), Survivor: Redemption Island 3.3/10 (+6.5%), Criminal Minds 3.6/10 (+12.5%), and Criminal Minds Suspect Behavior 2.6/8 (+8.3%). No Change: CSI: NY 1.8/6 and 48 Hours Mystery 1.2/4. Week-to-Week Losses: The Defenders 1.2/4 (-7.7%), 60 Minutes 1.2/3 (-14.3%), The Amazing Race 2.1/5 (-16.0%), CSI: Miami 2.0/5 (-9.1%), How I Met Your Mother 3.4/10 (-2.9%), Mad Love 2.7/7 (-3.6%), NCIS 3.8/11 (-13.6%), NCIS: Los Angeles 3.2/9 (-17.9%), and Rules of Engagement 2.4/7 (-14.3%). 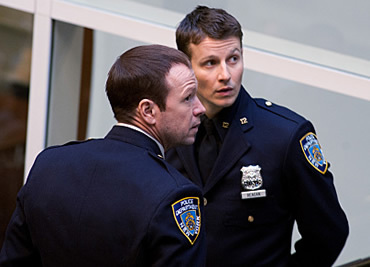 I will watch Blue Bloods which ever night you put it on but please don’t keep switching it–it is driving me crazy as I look forward to seeing it. My sister also watches it and we call during commercials to discuss the outcome and/or different characters! Much like its cousin the movie industry, the U.S. TV industry is more and more prone to consider international syndication and DVD sales in its decisions. If you don’t start to watch those numbers (such as “No. of countries show x is sold to” or “DVD sales of last season CSI:NY in Japan and Germany”), your predictions will be more and more off…. @rconair: That sort of thing may impact the deal between a studio and network but, unless the network benefits from the sales, why would they care? They care about what’s making them money and that’s advertising on the network.